This is Not a Coffee Shop - This is an Artisan Market with Café. Mercado369 invites you for an international coffee experience. 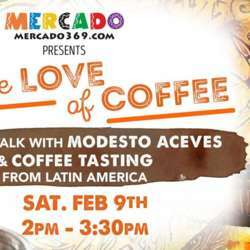 Experience the different tastes of Latin American coffees from local vendors and live painting from Modesto Aceves from aMODe Designs. Modesto is a Dallas artist known for painting with coffee. Coffee is one of the world’s most popular beverages. It not only tastes good and gives you energy, but it also has plenty of amazing, body-boosting benefits. Overall, there are endless reasons to love your morning brew.